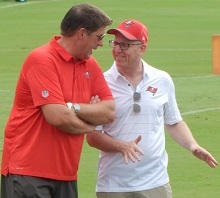 On Tuesday, Buccaneers co-chairman Joel Glazer was hangin’ with the sage of Tampa Bay sports, JoeBucsFan.com columnist Ira Kaufman, and the chatter turned to the Tampa Bay offseason. There was a clear emphasis on getting tougher and Glazer acknowledged it and said it represented a mission accomplished. The Bucs, though, were not known in NFL circles last year for being a nasty, tough, badass or physical team, and certainly their mental game was poor. Licht’s extra focus on tough guys this year is certainly not a new thing. Licht, like every GM, wants a tough team. But Licht has had his share of neck-up failures in the trenches, in addition to physical whiffs. Glazer’s comments lead Joe to believe the GM must be successful this season when it comes to the team’s toughness — or else. didn’t Mr. Blank say he was disappointed in how “soft” the team became under smitty and dirk and publicly acknowledged that the team needs to get tougher?…..
toughness starts with the HC…..then it trickles down to the players….this staff is anything but tough….baker and ward showed us that…..
licht can get all the tough players he wants but if the HC are soft finesse type coaches, nothing will change…..
Yah -” swaggy tree plunger ” had to be the final straw. It sounds like licht has done a great job in convincing the glazers that he’s found some tough players that are talented and productive…..
especially with a comment like this,” “It all starts up front, in the trenches, and Jason really addressed those areas.”…..
sounds like licht has said, “hey, I got talented players and depth, its up to the coaches now”, with the glazers keeping a close eye on the coaches this year…..no close loses or moral victories will save this staff in 2018!!!! I hear licht sharpening up his knives and dirks back is the target!!!!! There’s big reason Koetter and Smith were given their walking papers by Mr. Blannks in ATL. I get this feeling both will go down in Buc history as..knocking on the door and..not getting in. I do hope I’m wrong though. if Koetter were smart..thats IF..he would have immediately let Smitty go to his chosen Nursing home after last year. But thats his road Dog. So they brought in a big dog (defensive Line coach) to do Smitty’s barking for him on the sidelines while Smitty sits on his A.a up in the pressbox. It just smells rotten. But hey..Its a Buc life baby! Why would Licht get walking papers when he did his Job? He brought players in known to be productive. He drafted good as always. Only ppl I would say who’s jobs are on the line now are the coaches. Well I’m hoping the coaching staff figures it out this year and the players can execute. I’m sick of turning over the staff every 2 years. But if Koetter does get canned, I certainly would not mind Jim Schwartz. I wanted him for our defensive coordinator several years ago, but sadly it was not in the cards. I agree….I think licht has done enough to keep his job….its on the coaches now…..
813bucboi Says I hear licht sharpening up his knives and dirks back is the target!!!!! I hear Licht sharpening an AXE, a big AXE with Licht, Smitty and more as the targets. Success in 2018 or heads will roll. I could go on and on…..all “tough” coaches who’s team reflected their personality…..
and I disagree regarding tony and the other coaches…..tony was a strict disciplinarian type coach…..mike had a young mentally weak team…..schiano was just in over his head….. There is an interesting article on NFL.com by Greg Rosenthal that rates the top defensive lines in the NFL. I think either Joe will love the last sentence on their analysis of the Bucs defensive line and Gerald McCoy. I agree Licht has done his job. The coaching staff now reside on the hot seats. If the Glazers decided to start all over again at the end of this season they would be wise to retain Lich. However, I don’t know at this point who he might bring in to right this ship from the coaching side! P.S. I don’t have any expectations that anything like this will happen. I have a lot of faith in Koetter. I have the same high hopes this year and even higher expectations than last year at this time.